Daily Illuminator: Brett Lobs Blobs! November 7, 2018: Brett Lobs Blobs! 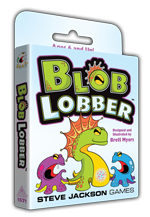 Not only will you have a chance to meet and play games with the likes of Steve Jackson, Phil Reed, and John Kovalic at Gamehole Con this weekend in Madison, Wisconsin, but Brett Myers, the designer of our brand-new game Blob Lobber (as well as our classic title Nanuk), will also be around. Track him down and perhaps he will deface your game cover with a signature!